← Happy birthday, Harry Blamires! We’ve written several times on this blog about the singular they usage problem, and we featured a blog post summarizing the findings of Klazien Tilstra’s BA thesis on the changing attitudes towards the pronoun’s usage. In the sentence above, however, singular they is not used as a generic pronoun, but as a pronoun in reference to a person not comfortable being addressed with masculine or feminine pronouns. 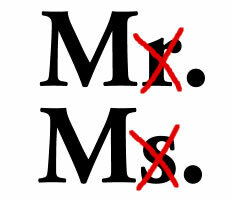 Although it might catch some readers’ attention, this usage is nothing new in the transgender community, along with the usage of the honorific Mx – a title devoid of gender qualifications following the M* pattern (Mr, Ms, Miss, Mrs). Mx is widely accepted by many UK companies and organisations and it has been in use since the 1970s. 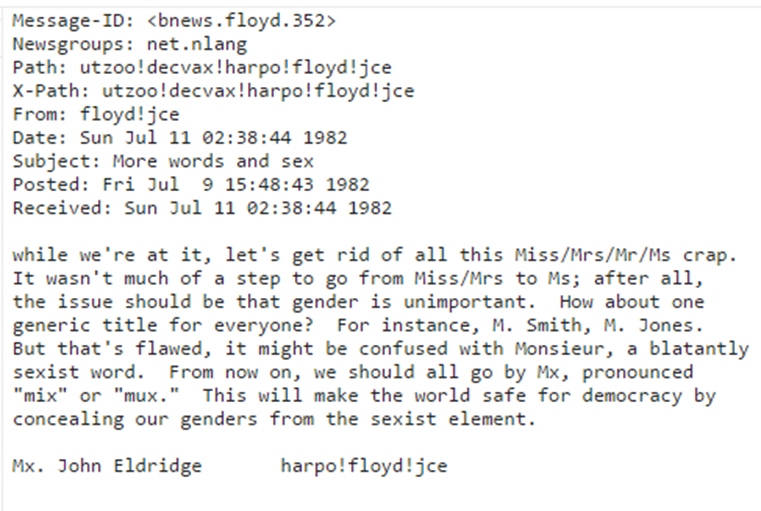 Here is a snippet from the 1982 Google Group Usenet archive advocating the usage of Mx, and giving guidelines on the title’s pronunciation. This is a case in point of what Curzan in Fixing English (2014) refers to as politically responsive prescriptivism (“rules/judgements that aim to promote inclusive, nondiscriminatory, politically correct, and/or politically expedient usage”) – you can read more on this topic in Stan Carey’s post on the Macmillan Dictionary Blog. Although its usage is still in the process of being spread and accepted, Mx’s time is quite certainly coming (the OED is considering adding an entry for it). As pointed out in the Merriam-Webster blog, it wasn’t until 1986 that the New York Times fully adopted Ms, now the default form of address for women. This entry was posted in usage features and tagged Anne Curzan, singular they. Bookmark the permalink. Thank you for sharing this useful source! It’s worth the read!